Imagine you have a friend who has gotten into substance abuse. His lifestyle is unsustainable. You have agreed to drive him to rehab. On the way he begins to complain that he is finding this whole transitional experience quite stressful. He insists that first you drive him round by the liquor store to pick up a case of Jack Daniels. It’s the only way he can imagine getting to his destination in comfort. Agreeing to the pipeline is rather like that. Back in the day, former television star Kirstie Alley ate a lot of food and enjoyed the comfort of it. When her obesity became dangerous, she and her doctors realized she had to change her consumption patterns. She did not need a more reliable home delivery supply-line of French fries and Mexican burritos. She needed to eat less. And to her credit she did. America does not need to get its old economy—it’s old way of doing business—back on track. Like publishing hardbound sets of Encyclopedia Britannica, that old economy is no longer sustainable. If we keep it up, and China and India keep copying us (which they tend to do), it will be catastrophic—apocalyptic, really. America needs a new kind of sustainable economy. America has traditionally excelled at envisioning and creating new things; here’s the next great challenge right before us—another opportunity to demonstrate national greatness. At this very moment we have members of our military in harm’s way on the Straits of Hormuz, protecting with a brave, patriotic spirit the American appetite for old-fashioned oil. In the eyes of our government, the delivery of Saudi Arabian oil must be defended at all costs. The Straits symbolize our current national vulnerability. It would be much safer for America to be dependent upon a nearby friendly nation (like Canada) than upon these distant, volatile, and often hostile ones. I get that argument. We want our heroes back from deployment more than anyone. It’s definitely the lesser of these two evils to buy Canadian. But here’s a third alternative: How about consuming less, so we don’t need to be dependent on anyone else? Perhaps the oil industry and their supporters don’t think America is up for any more new challenges. Perhaps they have written it off as a nation of obese couch potatoes, silly people of big girths and small brains. Maybe they think: America rallied after Pearl Harbor, but that was back when America still had character and a will to sacrifice for a greater good. Perhaps their only vision for the future is allowing greedy Americans to consume to excess. Yet every week I meet young adults who are just waiting to be challenged by a truly great and demanding ideal. They are not afraid. Many of them love the great outdoors. They mourn our steady trashing of the environment. They backpack in Yosemite. They cultivate flower gardens on their apartment balconies. They bike places. They pick up bags of garbage from riverbeds. This newer generation would gladly walk more and drive less. They are prepared for some serious belt-tightening in the short term, willing even to pay more for the energy they consume. All they want is real assurance that their efforts and their sacrifices will result in the preservation of the beauty of this great continent, the diversity of wildlife and insects, and the health of human generations to come. Many advocates of the pipeline argue that America just needs Canadian tar temporarily to help during its “bridge” to energy self-sufficiency. The flaw in that argument, of course, is that the shakers and movers of American industry have no intention of changing anything. The Keystone Pipeline project is merely phase one of an already-projected vast spider’s web of pipelines crisscrossing the North American continent. There is no race to self-sufficiency currently underway. There is no commitment to bridge to anything. The powers that be find the current arrangements exceedingly profitable. For obvious reasons they like things just the way they are. But a discerning public knows better. And there is at least one other consideration. The Canadians’ liquified tar is the dirtiest oil on earth. Getting it into liquid form in the first place, and then refining it into something useable, involves a vastly more polluting process in terms of emissions per barrel than any other significant source on earth. Quite frankly, it’s a nasty business. And most of that pollution is headed into American air, water and soil. The Canadians want it off their hands as quickly as possible. There comes a point beyond which an economic issue becomes a moral one. We have arrived at that point. In the Jewish and Christian Scriptures, the original name for human beings was earthlings. This planet is our home turf. Jews and Christians know that as humans we are called to steward (use, enjoy, preserve and maintain) the earth on behalf of its creator and rightful owner. We also know that greed is one of the seven deadly sins, and that simplicity and contentment are virtues. We know that happiness is not attained by consumption, but that its root lies in the domain of the spirit. 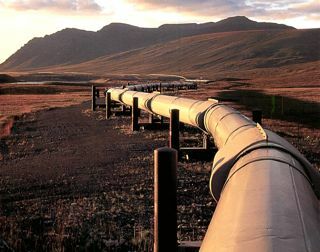 It is not hard to connect the dots from such a Christian way of seeing the world to the conclusion that the Keystone Pipeline is a bad idea.